WASHINGTON — Nine NASA-funded astrophysics missions, including the planet-hunting Kepler space telescope and Chandra X-ray Observatory, will continue scanning the heavens for at least another two to four years, the U.S. space agency announced April 3. NASA’s decision to extend the science operations for nine of its 14 in-orbit missions largely follows the recommendations of an outside panel of senior scientists that convened in late February to weigh the scientific merits of keeping these missions in service. Senior reviews for operating NASA science missions take place every two years. Scientists are charged with determining which missions are likely to generate the most "science per dollar" if they are approved to continue operating after their primary missions are complete. The last senior review for operating astrophysics missions, held in 2010, recommended the termination or phase out of the five lowest-ranked missions, including the Wide-field Infrared Survey Explorer, which was finally turned off early last year. This year’s senior review, chaired by University of Michigan astronomy professor Joel Bregman, opted not to rank the nine astrophysics missions up for review. "After considerable discussion, the committee concluded that a simple ranking of this sort is not adequate," the committee wrote in its report. The committee noted that because no major astrophysics missions have been green-lighted after the massively overbudget flagship James Webb Space Telescope, which is expected to launch in 2018, much of NASA’s astrophysics research depends on existing missions. "This reality, along with the challenging fiscal situation facing Federal science agencies, places greater emphasis on utilizing existing missions wisely, as well as finding strategies for reducing costs while not sacrificing the most important capabilities," the committee wrote. the Fermi Gamma-ray Space Telescope, launched in 2008.
the Hubble Space Telescope (HST), launched in 1990 but last refurbished in 2009. Planck, a European satellite launched in 2009. Suzaku, a Japanese X-ray astronomy satellite launched in 2005. Swift Gamma-ray Burst Mission, launched in 2004.
the Warm Spitzer Space Telescope Mission, which has been operating since 2009 without the coolant that kept its infrared instruments chilled for its first five-and-a-half years in orbit. XMM-Newton, a European X-ray observatory launched in 1999. "These nine missions comprise an extremely strong ensemble to enter the Senior Review process and we find that all are making very significant scientific contributions," wrote the 12-member committee that conducted the 2012 Senior Review of Operating Missions in the NASA Astrophysics Division. 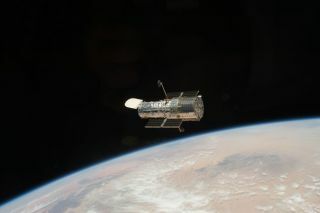 The committee shot down a proposal to increase Hubble’s funding above its $95 million per year level and urged NASA to find ways to cut costs. "To keep [Hubble] operating while maintaining the overall balance of NASA’s astrophysics program it will be necessary to seek further cost reductions, even at the expense of some observing efficiency," the committee wrote. In a short statement posted on the NASA Science Mission Directorate’s website, NASA said that HST operations will continue "at their currently funded levels." NASA also approved extending Fermi’s operations through 2016 but with a 10 percent per year funding reduction beginning in 2014.Two missions, Suzaku and XMM, were singled out as having "critically low funding." In addition, the Swift mission was characterized as "poorly funded," a less dire circumstance than "critically low," according to the report. NASA, in response, approved continued support of Suzaku operations until March 2015 to provide a one-year overlap with Japan’s follow-on Astro-H mission. Funding for U.S. support of XMM-Newton was also extended through March 2015 and Swift was approved to continue through 2016 with additional funding for data analysis. Spitzer’s operations, meanwhile, will continue through 2014 with closeout in 2015, according to the NASA statement. NASA said that all decisions to continue operations through 2015 and beyond will be revisited during the next senior review in 2014.